"Ten Men is equal parts autobiography, character study, leadership manual, and profound philosophy. Bill Curry has a wonderful gift for portraiture… This is by far the best book about the NFL I've ever read." "No sport rivals football for building character. In the scorching heat of two-a-days and the fierce combat of the gridiron, true leaders are born. Just ask Bill Curry, whose credentials for exploring the relationship between football and leadership include two Super Bowl rings and the distinction of having snapped footballs to Bart Starr and Johnny Unitas. In Ten Men You Meet in the Huddle,Curry shares the wit, wisdom, and tough love of teammates and coaches who turned him from a next-to-last NFL draft pick into a two-time Pro Bowler. Learning from such giants as Vince Lombardi and Don Shula, Ray Nitschke and Bubba Smith, Bobby Dodd and even the indomitable George Plimpton, Curry led a football life of nonstop exploration packed with adventure and surprise. 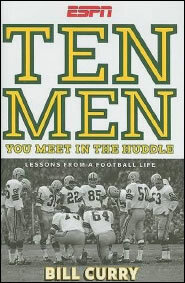 Blessed with irresistible characters, rich personal history, and a strong, simple, down-to-earth voice, Ten Men You Meet in the Huddle proves that football is much more than a game. It's a metaphor for life." Bill has written numerous columns for ESPN's web site on topics ranging from the character traits of winners to the psychology of redemption. Click here to read his past columns. As he drives cross-country to his last training camp with George Plimpton in tow, Bill reflects on his NFL career, the life lessons he learned through football, and some of his most memorable anecdotes. Bill authored a chapter entitled "The Pedestals Are Vacant" on the inevitable nature of society's obsession with sports and on the redeeming virtues of athletics that are often overlooked. Bill authored a chapter entitled "The Taylor Torture" in which he reminisced about his Packer teammate Jim Taylor, including Jim's brutal weight lifting and conditioning workouts.